The history and future of Jewelry or anything in the context of time for that matter, are light years apart, yet remain inseparable, and paradoxically hardly ever considered as one whole something. I guess the jewelry shoobies are too busy making money. 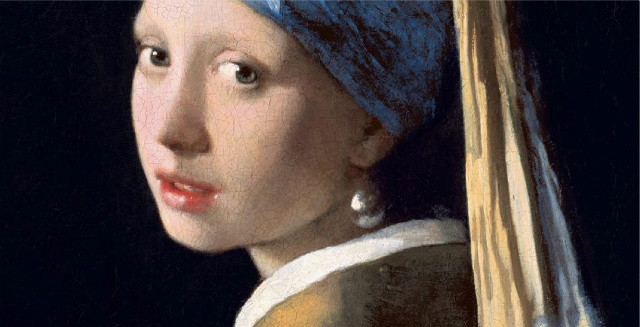 In the interests of jewelry for arts' sake, glance back over your shoulder like the Girl with a Pearl Earring Masterpiece (top of this page) and Google stalk your Jewelry past (the reason I created this website!). See the Natural Pearl earring dangling from the girl's ear, you can't miss that gleaming light-filled pearl earring right? And like the pearl, our past, becomes the focal point. What has proceeded, lest we forget, holds great lessons for our present and future station. From the Magic Baroda Carpet ride perspective we see the bejewelled landscape in days gone by, continually interrupted by wars and politics, and paradoxically also shaped and propelled by those very same forces. It's one big conundrum, because from my perspective, fine estate & period pieces created for her human nature by his master art is an enduring reflection of the human spirit in its highest and purest form. A symbolic expression of the human love narrative (not war narrative) in three dimensional space-time expressed as only a true craftsperson can express. Post modernity is practise during intermission. In the Anthropocene at the dawn of Aquarius, might we not pause and consider Her account in the Future of Jewelry because a woman can sense the Jewelry narrative as only a woman can. It just makes sense. Jewelry in a World Without War? How will the Jewelry narrative survive, if there shall be a world without war in the future? From past Jewelry history - we can determine there hasn't ever been just one "History of Jewelry" - there's been many Jewelry His Stories written in general from a male point of view. Histories of the artists. Histories of the designers. Histories of the international maisons. Histories of the jeweled craft and the histories of the goldsmith's art and so on, and so on. Most Jewelry narratives already written in the historical context mostly refer to the different styles and considers the continuing presence or absence of similar features. In this sense, the alterations of stylistic periods are marked by Historical events such as..err... the two world wars of the 20th century, the wall street crash of 1929, the economic boom following the second world war. From the Famous Jewelry Collections, to the cut of the gemstones a jewelry art historian might arrive in a closer approximation of the nature of the jewel, by careful examination of the gemstones they contain, free of Historic bias. Drawing from language, the actual word, 'antique' comes from the Latin word 'antiquus' which means 'old'. The word 'jewellery' is derived from the word 'jewel' from the Old French word 'jouel' in around the 13th century - the word 'jouel' comes from the Latin word 'jocale' which means a 'plaything'. Antique Jewelry is jewelry that has reached 100 years or more, some argue 70 years only, in both cases, making it is a witness to a previous generation in history. Historically, however, "antiques" hold a particular reference. Those antiquities from Old Greek and Roman civilizations, known as the 'Age of Antiquity' although considered antiques, the term is applied loosely, not in the true sense of the definition. In the Pantheon of Jewels, Antique Jewelry and 20th century Jewelry, is an ongoing commodity, a tribute, and an artistic record of humanity, at it's very finest. The magnificent Jewelry holds special significance in history. It has strength and roars quality and provides often a more accurate account of our history than more modern written accounts. By cross-referencing period styles, forms and the materials used in the history of jewelry, dealers and collectors can period date pieces with a greater deal of accuracy. After-all, bones & stones, antique diamonds, including the amazing blue gemstones, and antique gold work don't lie. Antique jewelry and 20th century Jewelry, may be embellished with precious and non-precious gemstones. Each piece tells it's own story. Many pieces are expressions of great intimacy. Local customs often made it impossible for people in love to express their love openly - Jewelry came to the lover's rescue! It offers an intimate form of expression with forever lasting quality. Click HERE to find out more about the sexuality of wedding rings. Fine jewelry, crafted using jewelry techniques practiced during that period, involved materials that were popular in that same period. Handcrafted Antique Jewelry was executed with painstaking attention to the finest details, just consider Peter Carl Faberge's most celebrated achievements. Camilla Duchess of Cornwall's Diamond Engagement Ring is a perfect example of the linear perfection in Art Deco Jewelry of the 20s. A symbol of love in the shape of a platinum and diamond antique engagement ring has been appointed keeper of the royal flame of love, for over a generation. History and family tradition, add romance and value to a heirloom antique engagement ring. Antique Jewelry is categorized into separate period styles. Time travelling into the past, let's take a closer look at each design period. Our jewelry time travel journey begins at the dawn of 18th century and travels towards the present, ending at the dawn of 20th Century. Our time travel is in Europe. Premier jewelry, gemstones, and Natural pearls have answered a deep and personal love of beauty throughout each of the period styles in the history of jewelry. But that's just half the story. Jewelry, gemstones and Natural Pearls have been used strategically in world politics and quite brilliantly by British royalty and French royalty, such as Emperor Napoleon and the acquisition of fine Jewelry of the Georgian period. Jewelry existed, very strongly as an art form in which style and fashion were set by the aristocracy. Bourgeois jewelry, peasant jewelry and jewelry in less precious materials, that we now call costume jewelry were all simply imitations of court fashions. Click on the links below to enter the decorative periods during the history of jewelry. 1714 - 1830 Georgian Jewelry is named after the four successive English kings, George I, George II, George III and George IV and it spans most of the 18th and part of the 19th century. On the European continent it is called the Louis styles, named after the French kings Louis XIV, Louis XV and Louis XVI. 1837 - 1901 Victorian Jewelry officially starts with the coronation of a very young Queen Victoria. It ends with her death at the age of 82, in 1901. Inspiration form mother-nature resulted in the greatest period in English, European and American Jewelry. 1901 - 1914 Edwardian Style Jewelry officially begins in 1901 when Edward VII took the throne at the age of 56. Although Edward VII died in 1910, the "Edwardian" style continued until the outbreak of the first world war in 1914. Coinciding with 'la belle époque' fashion era on the continent, a French term which means 'beautiful era'. 1918 - 30 & Art Deco Jewelry was a relatively short period in the history of jewelry. This was the "Roaring Twenties" and signified an overriding lust for life and the emancipation of women. 1930 - 1940s Antique Costume Jewelry or Retro- modern jewelry of the 1930s-40s was jewelry to wear at the new 'cocktail' hour. Basically made for women to show off in. To be glamorous and razzle-dazzle with fascination and without formality. So, what will the FUTURE map of the "History of Jewelry" look like? Since 1918 few Jewels have been designed for court wear in any country and since 1939, even less. Adding to that is a fact, that, for political and economic reasons, the West does not encourage the making of such splendid Jewelry anymore. To every cloud there is a silver lining. Scarcity is good news for the Antique Jewelry Investor, because it means that Antique Jewelry, Period and Estate Jewelry already in short supply will become more scarce and rare in the future. And consequently more precious and increasing in value as you enjoy wearing it. In concluding, Lest We Forget (Jewerly history has been continually punctuated by war & "reeking tube & iron...") the Jewelry narrative in a world without war in the hopefully not too distant future, might be better served using the grammar of the heart.